Regular readers of my weekly trip back to the ARIA charts from 1989 will know I'm not the world's biggest fan of rock music. And, while I can write for paragraphs about the impact (or lack thereof) of "I'd Rather Jack", I struggle to have very much to say about the harder end of the music spectrum. A song I did actually like leapt to the top of the ARIA chart this week - "Eternal Flame" by The Bangles dislodged Madonna and looked like it was set to take up a lengthy residence at number 1. However, the switcheroo at the top spot was far from over. It's quite fitting that before we head into our rock-fest, we come across an Australian synthpop/funk group who struggled for credibility in an industry obsessed with pub bands and guitar rock. At this stage of their career, Wa Wa Nee were also struggling on the charts, with this third single from second album Blush unable to even make it into the top 50. The writing had been on the wall when the album's first two singles failed to become sizable hits - but the disappointing performance of "I Want You" was really the nail in the coffin for Wa Wa Nee, who disbanded shortly after. But, like so many other '80s acts, it was only a matter of time until Wa Wa Nee was resurrected - and Paul Gray has been performing reasonably regularly in recent years. Describing Robert Palmer as a rock artist is to sell him a bit short, but for the purposes of this week's post, he fits the mould well enough. After all, his two biggest singles, "Addicted To Love" and "Simply Irresistible", not only had the same video but were at the rockier end of his repertoire. But, that's not the whole story - Robert also released tracks with synthpop, soul and funk stylings over the years, and even had the audacity to release this single, which sounds like a riff on The Tokens'/Tight Fit's "The Lion Sleeps Tonight". The cute animated clip (which contained a nod to his more famous music videos) almost allowed him to get away with it. OK, onto our first rock song proper, and it's yet another under-performing release by one of my favourite Australian bands of the '80s. The third release from the Touch album, "Simple Man" became the fifth (of six) singles by the group to peak between numbers 60 and 40, which must have been endlessly frustrating for them. I do like "Simple Man", but I can't help but think "In My Youth" would have been a better choice at this point since "Simple Man" was reasonably similar in feel to the band's previous flop single, "Voice Of Reason". By the time "In My Youth" was released... well, we'll see what happened there in a couple of months. Side point: could the lack of success of both "Voice Of Reason" and "Simple Man" be at all linked to the fact that singer Jon Stevens lopped off his luscious locks following "Touch"? He may have gone on to play Judas in Jesus Christ Superstar, but perhaps he had more in common with another Biblical figure: Samson. Here's an artist whose rock star hair was still intact - and can it be any coincidence that John Cougar Mellencamp (and his flowing mane) enjoyed his highest-charting single since 1982's "Jack And Diane" with this first taste of his 10th album, Big Daddy? Probably. As American as apple pie, JCM is the epitome of good ol' fashioned rock'n'roll - and although it's not my genre of choice, I'd actually enjoyed quite a lot of his songs up until this point. "Pop Singer" didn't do it for me, though - the melody was a bit monotonous - but at least it was a mercifully short track. Calling his second album Repeat Offender was asking for it, really, although soft rock hitmaker Richard Marx was still flavour of the month at this stage - especially in the US, where "Satisfied" became his fifth straight top 3 hit. Sure, he'd end up seeming a bit daggy by the time his chart career wound down in the mid-'90s, but for now, the singer/songwriter who verged between rousing radio-friendly rock tracks (like "Satisfied") and sickly ballads (like previous single "Hold On To The Nights"), was a multi-platinum success story, with even bigger things to come in Australia. Speaking of sickly songs, here is one of Bon Jovi's best known power ballads - but for me, it was nowhere near as good as "Never Say Goodbye" or "Wanted Dead Or Alive". In fact, it was the first of a string of rock ballads by the group (including "Bed Of Roses" and "Always") that I found pretty much unlistenable. 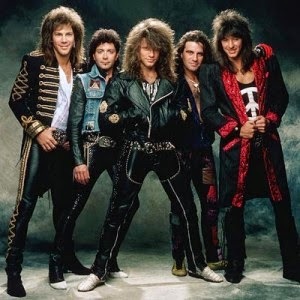 It wasn't just Bon Jovi recording this kind of song, either - with the likes of Warrant ("Heaven"), Poison ("Every Rose Has Its Thorn") and Bad English ("When I See You Smile") all releasing these ultra-commercial, over-emotive tunes. Naturally, the Americans loved that kind of stuff and sent all those tracks towards the very top of the chart. In Australia, "I'll Be There For You" became another single by Bon Jovi to miss the top 20 - somewhere they wouldn't return as a band until 1992. Although I don't really like this whistle-heavy ballad by Guns 'n' Roses, either - I give it credit for having more edge than the likes of "I'll Be There For You". "Patience" was the only single released from G N' R Lies, a follow-up to Appetite For Destruction that contained a mix of four previously recorded tracks and four new acoustic songs, including a version of "You're Crazy" from Appetite... Although the album was a bit cobbled together, the band was so hot that both it and "Patience" sold solidly, and they would have served as a good stop-gap measure until their next studio album proper if that gap hadn't ended up extending for nearly two-and-a-half more years. Next week: pop fights back with new singles from the biggest pop star in the world, the biggest pop star in Australia and the biggest new boy band on the block. Before then, I may or may not have made a start on my countdown of my favourite songs from 2004 - but it's coming soon. I'm pretty sure this was the first week that I tried setting the timer on my parents' VCR to record the rage top 50, rather than getting up at 5:30am to watch it live. Except that my first attempt at setting the timer didn't work. I had more success with that later in the year, but also a couple more failures, as late as 1991. If I remember correctly, I didn't catch the top 50 until #34, when 'Patience' was on. Rage at this stage only repeated the top 30 on Sunday morning. 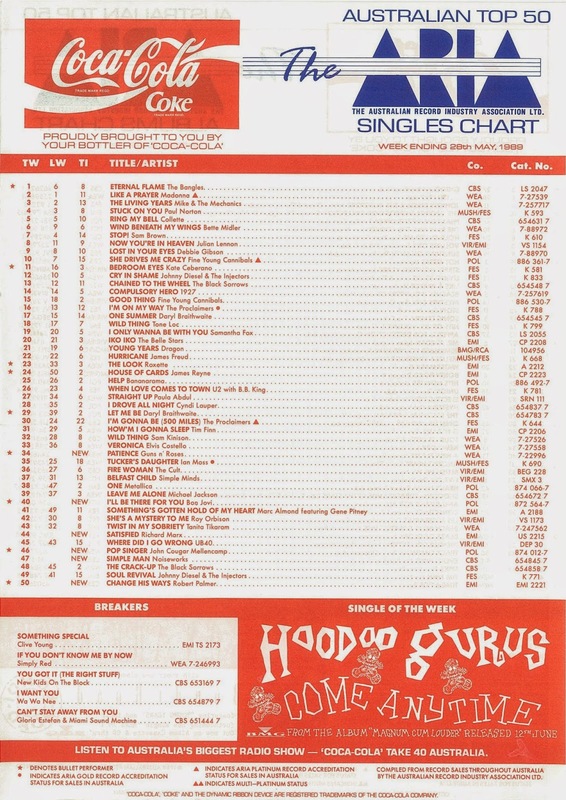 So I had to listen to Take 40 Australia the following weekend to grab numbers 40 to 35, and I never knew what positions 41 to 50 were this week until viewing the top 50 on the australiancharts.com website about 5 years ago (I also didn't pick up an ARIA chart during the week). It turns out that the only video I missed that wouldn't air on the top 50 again (or hadn't before) was 'Simple Man', which is OK, but I wasn't really interested in anyway... but I don't think I'd seen until now. I loathed 'Bed of Roses' and 'Always' (both seemed inescapable at the time, making them even worse), but can stomach 'I'll Be There Fore You' more easily... probably because it's largely forgotten (here anyway). It's still pretty bland though. I was pleasantly surprised that 'Eternal Flame' leapfrogged to #1 this week. It's quite strange though how neither of their Australian #1s managed to spend consecutive weeks at #1. I couldn't stand Bon Jovi's ballads either. Although, I did have a liking to 'Bed Of Roses' but it goes far too long. Over the years, I have learnt to appreciate 'Always', but yes, we did prefer their rock tracks. Noiseworks 'Simple Man' went over my head. I always thought 'In My Youth' was their 3rd single. I had never heard the track or seen the video until recently. Only just recently, I have been getting into Richard Marx (well his early years) and just purchased his self titled debut from '87 and 'Repeat Offender'. 'Satisfied' although a great track, surprises me that it went to No.1 in the US. I always thought 'Check It Out' was JCM's biggest hit in OZ. For some reason I thought it went Top 5 here, but checking out my ARIA charts it only went Top 25! I'm glad after last week when everyone liked the songs I hated that I'm not alone in my distaste for dull Bon Jovi ballads! I remember seeing Wa Wa Nee perform at Sydney's Royal Easter Show I think in 1989, alongside Midnight Oil. Most of the crowd were there to see the latter perform but I was quite a fan of the former. I remember someone in the crowd shouted out 'Get off you ******s' as Wa Wa Nee performed. I just cringed. I remember the Rage Top 50 starting at about 5.20am, but I could only manage an alarm at 5.40am each Saturday following MTV the previous evening. My parents had an old black and white TV which they weren't using and I kept it in my room for the weekend. So seeing some of the videos here in full colour is new to me. Why on Earth would anyone have teamed Midnight Oil and Wa Wa Nee on the same bill, that's what I want to know.